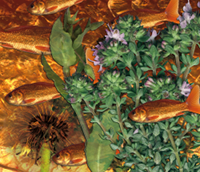 As a graduate of the art academy in Strasbourg, I am a freelance graphic designer and illustrator since 1991. So I'm interested in Scanography not just since yesterday. I use this new medium both for my private work, as well as for my commissioned works since 1995. That was long before I have created the website "www.Scannographie.org", which is now worldwide known as a reference in this area. (Please click to enlarge) A project, I have especially focused on the recent years, is to create a collection of images of my garden's flora and fauna. The images for this collection I put together from various weekly made scans. 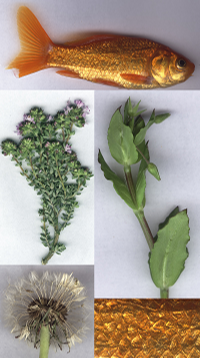 I arrange 4 to 7 plants or animals that I've found all at the same time for each image. 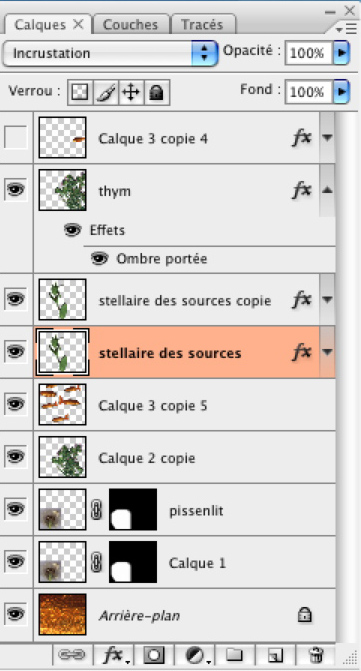 Overall, I have created 53 such images, that altogether make up a kind of "fantastic", but also documentary herbarium almanac. The impression of "alien landscapes" results primarily from the technical features of the scanner: almost no depth of field, uniform illumination with no noticeable light source, no perspective, no shadows, but an incredible amount of details with a special sharpness. 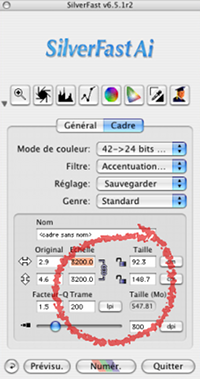 On the basis of these images I would like to present my workflow here. The example image was created in the last week of March. 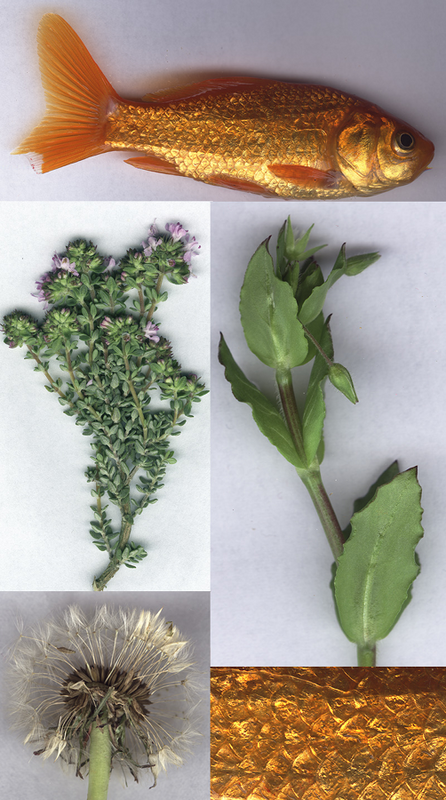 It is composed of 5 individual scans: a goldfish, a detail of the scales of the fish, a branch of thyme, a branch of chickweed and dandelion with seeds. First, each element is placed separately on the scanner, scanned and stored on the hard disk. - Using the first button I reset all settings with one click. 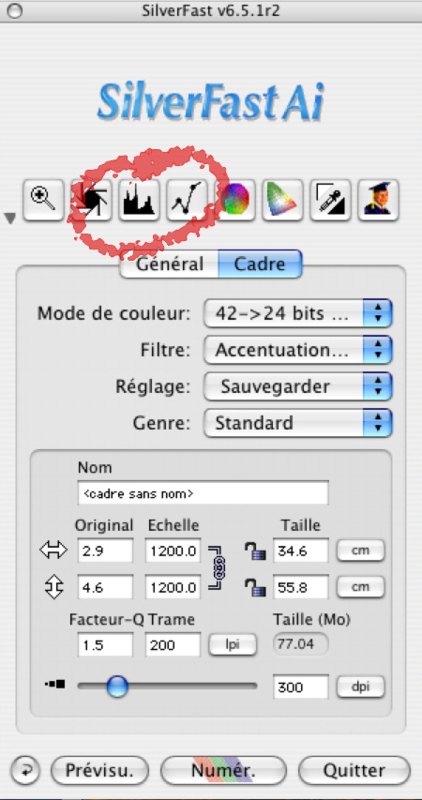 - As the second step I narrow the tonal range of the colors in the histogram before scanning to the range of the original to achieve really deep colors in the dark image areas. 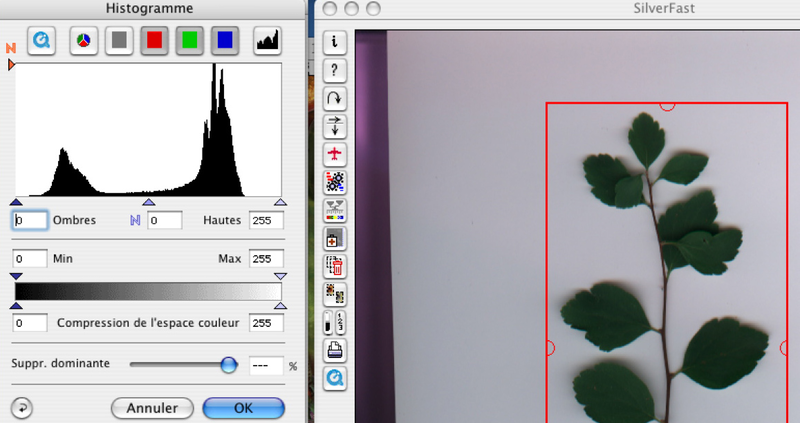 - Finally, I quickly adjust the histogram curves and thus the brightness of the image. I work very instinctively and adjust the settings individually for each scan. 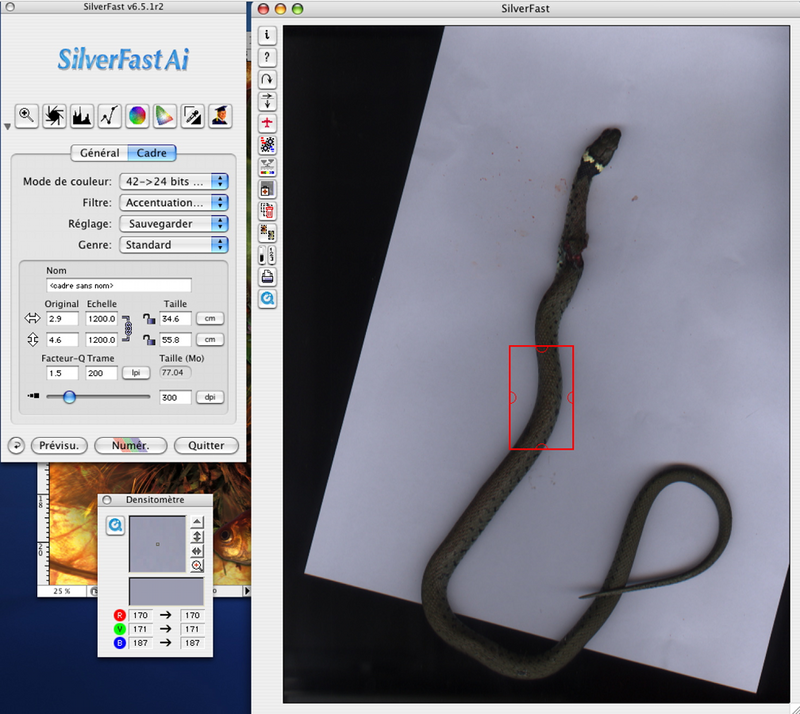 SilverFast also allows me to adjust the later file size. 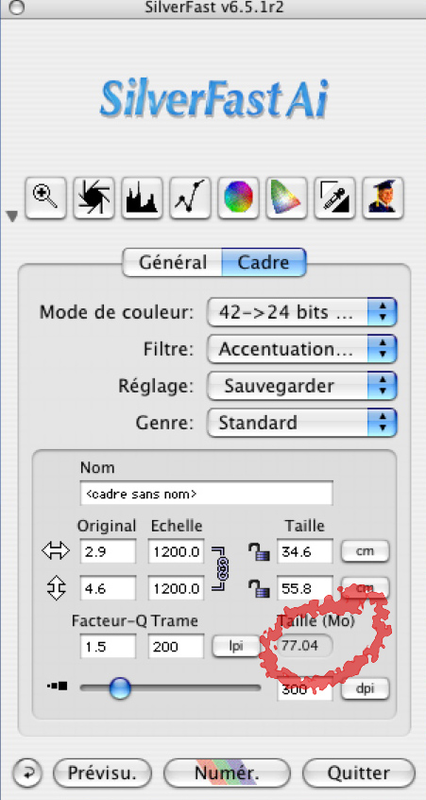 And I always try to choose a file size between 65 and 90 MB, a size that allows using it for offset printing up to A3 size. Regarding the scanner a much higher resolution would be possible. 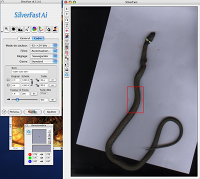 Another important function of SilverFast is to save presets. 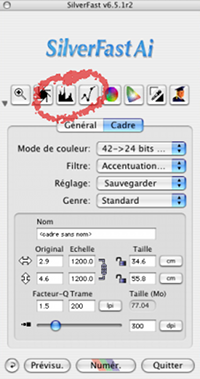 In order to have a reusable working basis a set of basic settings (size, curves, histograms) can be provided with a name and saved. They can be reloaded and still adjusted any time later. As Marsha explains on her site, some of the presets and automatics are well chosen and can be used unmodified. 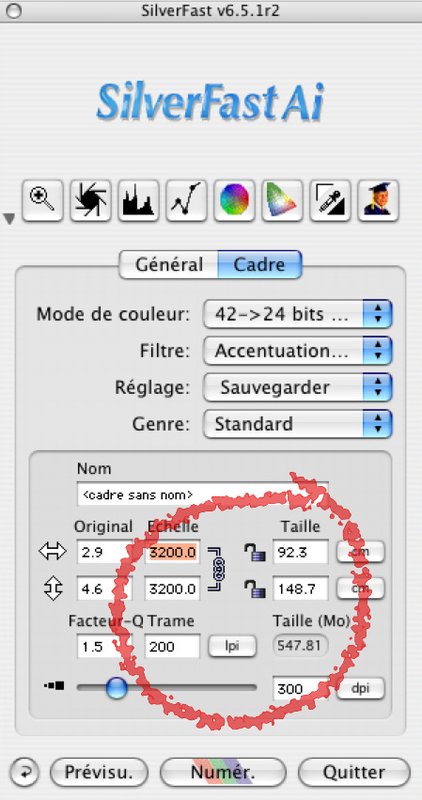 I always scan my images with a resolution of 300 dpi. This is the ideal resolution for offset printing. 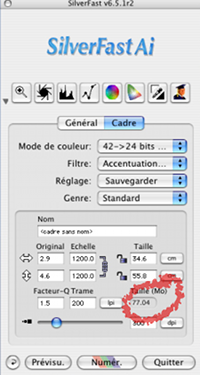 The maximum possible print size depends on this parameter and is displayed in the program in cm. Thus, no surprises are to be feared. 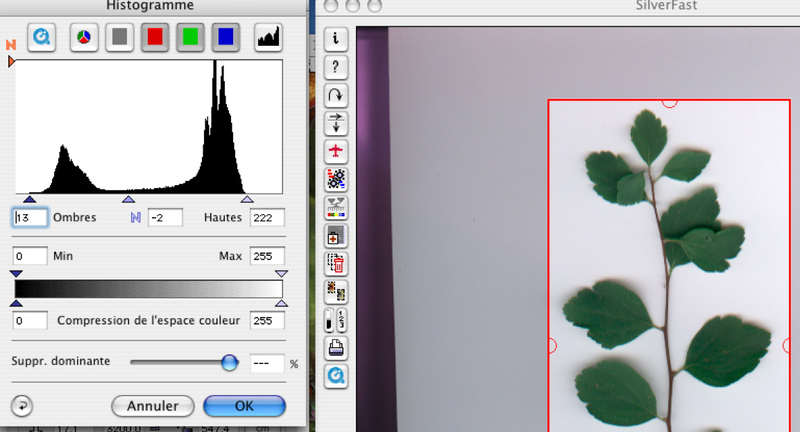 Now, after all scans are created, the Photoshop work begins. 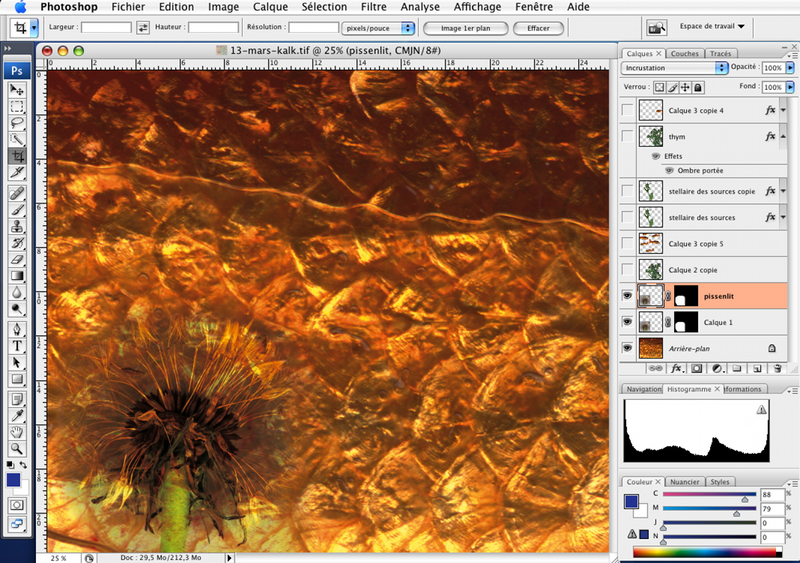 The first step is to remove "impurities" and to prepare the images for later use. Much of this work consists in cutting out the subject. A work that seems very tedious, but that can be very interesting also, because thereby the object is analyzed really thoroughly. I have more than 500 scans in my archive, which serve me well as a good base for my own works as well as for the graphic layouts for my clients. My work here is now to create a fictional landscape from the scanned elements. The fish will be the main theme, an aquaristic theme, even if the plants do not originate from under water. The goldfish has been found on my balcony. Our cat, who is also a good hunter, has fished it out of the garden pond. (Please click to enlarge) For this series, all images have the same size of 25x20cm. Therefore, I first cut the background to this size. 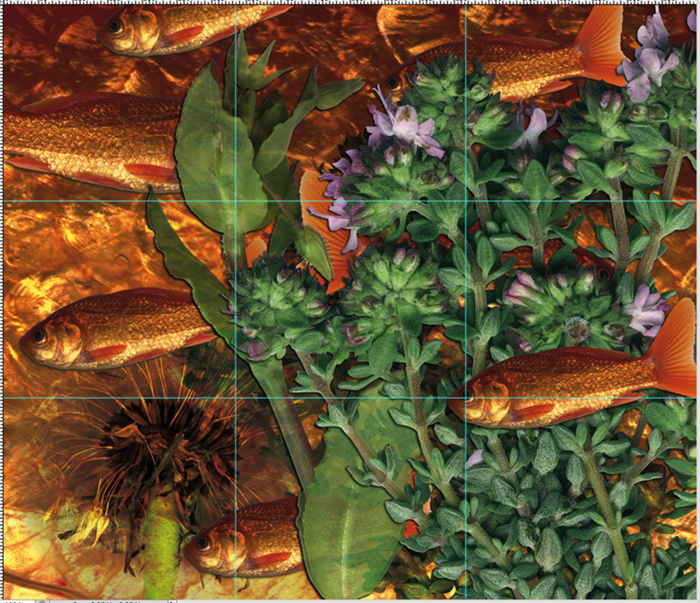 I now place the various elements on this background in a way that the whole composition is harmonious for the viewer. Hereby, I pay much attention to the Golden Rule, to color harmonies and to a balance of the quantity of each item. To really always follow the Golden Rule, I first create a grid that shows me the 4 corresponding intersections. 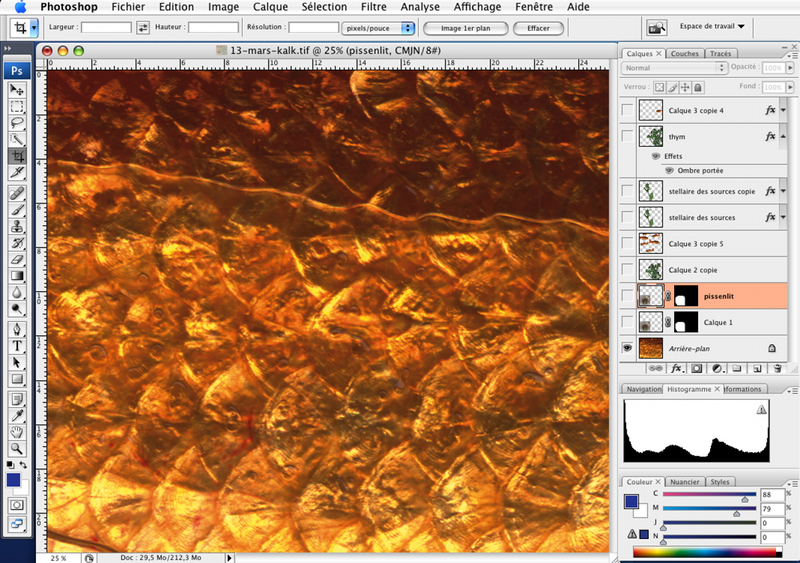 In this case is to notice, that the golden colors dominate the left third and that the eye of the fish is accurately located at a crossing point (bottom right). 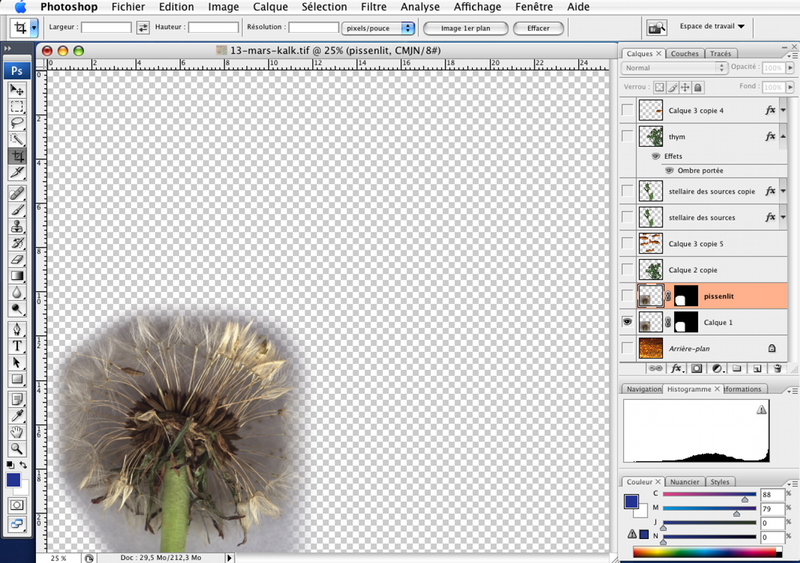 After that I work a lot with the layer effects that Photoshop provides, such as the overlay function for the dandelion. 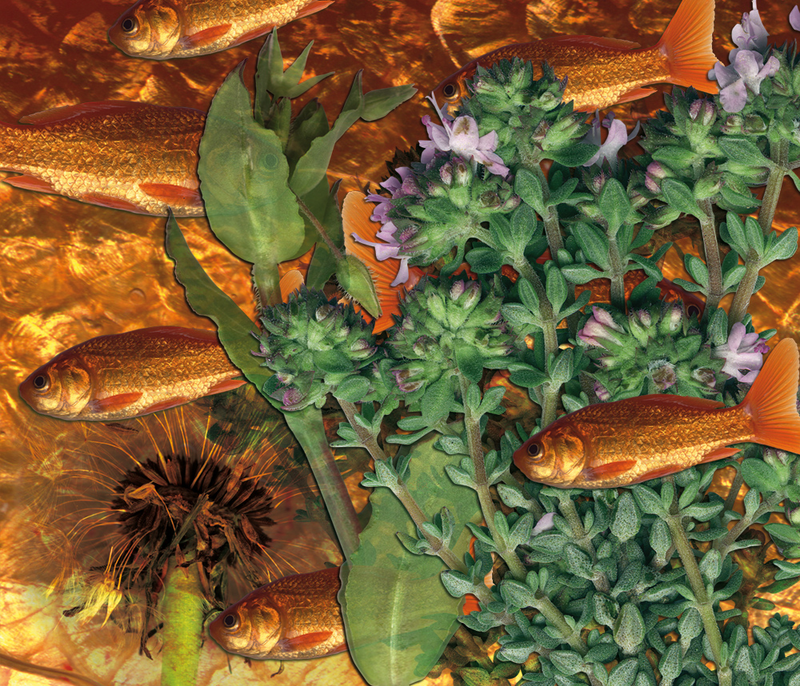 For the chickenweed I used a transparency effect, which fits well with the aquaristic atmosphere of the image. 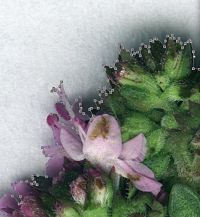 Objects that were cut very carefully like the thyme even can contain shadows that give a sense of depth to the whole image. Eventually, all the elements are arranged. 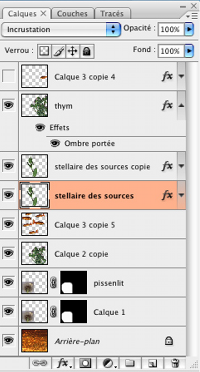 They appear all on their own layers in the Photoshop palette. The final result can be seen on the lower left. You can find more images of this series at my homepage in the "Scannographie" category. 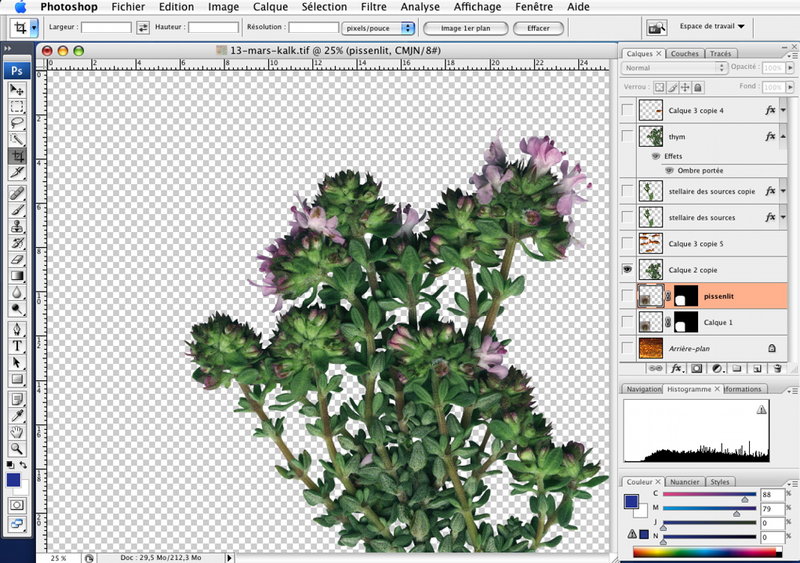 The result is neither a photo nor an illustration. No perspective, no depth of field, unreal proportions of the individual elements and surprising sharpness throughout the whole image offer something completely different to the viewer, than what the eye is normaly used to see. Some Scanographers play - within the limits of the scanner - with movement during recording. A scan takes a few seconds. If you move the object meanwhile, there are very special effects, resulting in almost abstract images, that are sometimes similar to the works of Italian Futurists in the early 20th Century. Scanografie is not a complicated matter. You need a computer and a scanner and then it is: just try it. To obtain a more comprehensive overview of the topic, please visit the website Scannography.org. There you will discover many talented artists, who have developed very different, individual styles.